Sheppard Pratt has created a highly effective trauma therapy program, which personalizes care to meet the needs of each patient. The Trauma Disorders Program offers a range of effective treatments for trauma-related disorders. A patient’s psychiatrist, psychotherapist, social worker, nursing staff, and rehabilitation staff all work as a team to care for patients. Phase one establishes basic safety and stabilization of severe symptoms. To assist you in stabilizing symptoms, we will teach you a variety of coping skills. Phase two remains focused on the goals of stabilization and safety. At the same time, it concentrates on recalling, processing, and desensitizing emotional events and trauma memories. We do not engage in phase two intensive memory/trauma processing on The Trauma Disorders Program inpatient unit. In general, phase two occurs as part of long-term, outpatient treatment for complex post-traumatic and dissociative disorders. It requires you to have achieved basic stabilization of safety and severe post-traumatic and dissociative symptoms, as well as show skill in using symptom management techniques independently of the therapist. Phase three focuses on reconnecting to the present since, in this phase, traumatic memories generally do not dominate your daily life. Most people in phase three no longer require inpatient treatment unless a major life crisis occurs. Psychotherapy, or individual therapy, is central to healing and recovery. Patients who need treatment for a dissociative disorder or complex PTSD often respond well to psychotherapy, particularly when it is part of a comprehensive treatment plan. You or your loved one will see a therapist for individual therapy three times per week for 45 minutes each session. This one-on-one interaction gives you the opportunity to explore issues that arise during treatment. You also can practice symptom management skills with your therapist. Because trauma experiences may at first be unspeakable, we offer opportunities for patients to express themselves in nonverbal ways. We provide specialized trauma-focused art therapy to help people engage in emotional regulation and stay grounded in the present, among other therapeutic goals. This powerful technique also helps people contain traumatic experiences within artistic imagery, so they can feel more control over flashbacks and other trauma intrusions. We provide specialized trauma-focused occupational therapy at The Trauma Disorders Program. In groups and/or individual sessions, the occupational therapist will discuss aspects of your everyday functioning and support enhanced participation in life tasks, particularly areas that have been affected by trauma such as sleeping, hygiene and meal preparation. Specialized occupational therapy groups provide opportunities to engage in leisure, creative expression and cognitive task activities to assist with skill development surrounding grounding and containment. In addition to art and occupational therapy, we offer journaling groups. Research shows that therapeutic journaling can have positive effects on stress management and can help with reducing symptoms of PTSD, dissociation, anxiety, and depression. All members of our community — physicians, therapists, nursing staff, social workers, rehabilitation therapists, and patients — actively contribute to the therapeutic milieu. In this supportive environment, we emphasize safety and stability throughout treatment. We provide opportunities for peer support and ways for patients to improve relationships and practice new skills. Patients often find a reduced sense of isolation when they realize that they are not alone, and that many others share similar symptoms and difficulties. This can make it easier to engage in the hard work of trauma recovery. Accountability is a cornerstone of the therapeutic community. Patients take responsibility for their behavior and hold members of the community responsible for their actions through feedback. We encourage patients and staff to model behaviors that support a sense of respect among community members. 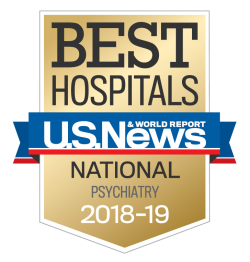 Our psychiatrists are experts in the treatment of complex trauma-related disorders, including other disorders that accompany them, such as depression and sleep problems. We understand that medication and psychotherapy complement one another, and are not “either-or” solutions. In general, psychotherapy is the primary treatment of PTSD and dissociative disorders. Medications can help reduce symptoms to allow better participation in therapy. To learn more about the trauma therapy we offer in The Trauma Disorders Program, contact the administration office at 410-938-5070. For referral information, providers can contact the admissions coordinator at 410-938-5078.